This year's month long Karamayan Kaamatan (Harvest Festival) will kick off in a small West Coast town of Tamparuli. For several years now the month of May has been officially declared as the State's Harvest Festival celebration month. 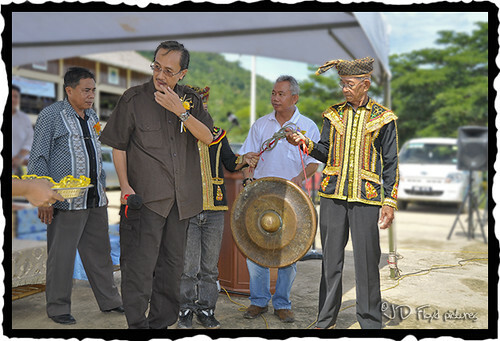 The beating of gong to commemorate the traditional festival will be on 1st May 2011 at Dewan Tun Hamdan, Tamparuli. Note: Unless otherwise specified, all pictures in this article were taken by the author himself. 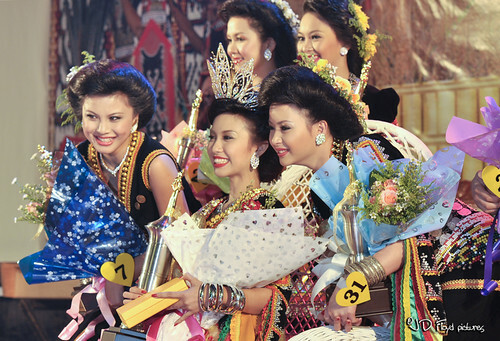 Related opening ceremony which happened on 1st May 2009 in Papar can be viewed here. 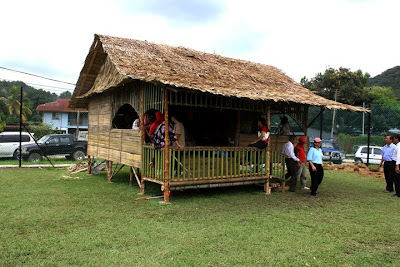 Picture showing of one of the Walai (traditional dwelling house) constructed to give a brief impression of the kind of shelter our grandparents had in the olden days. ﻿So, lets throng Tamparuli this Sunday and get to witness first hand, not just the celebration but the taste of foods you wouldn't find elsewhere, the culture and especially the warm welcome and friendship you will feel as you walk among the folks. Bukit Ruhiang (some call it Bukit Prahu): The World Class Paragliding - Sabah Malaysian Borneo XC 2010 competition was held here in June 2010. Note the tiny size para-gliders waiting to be flagged off. 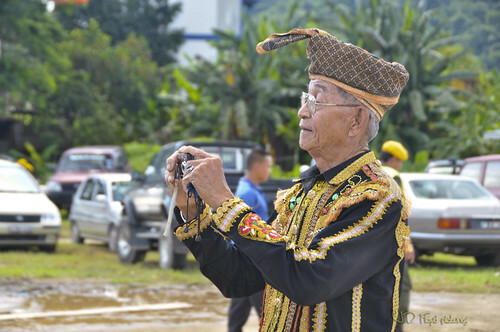 "Digital age": A man in traditional costume taking picture of the crowd during the World Class Paragliding - Sabah Malaysian Borneo at Tamparuli Tamu ground.
" Sebenrnya ramai juga saudara-mara saya di Tamparuli in..", Datuk Masidi Manjun - Minister of Tourism, Culture and Environment, Sabah as he officiated the World Class Paragliding in Tamparuli. 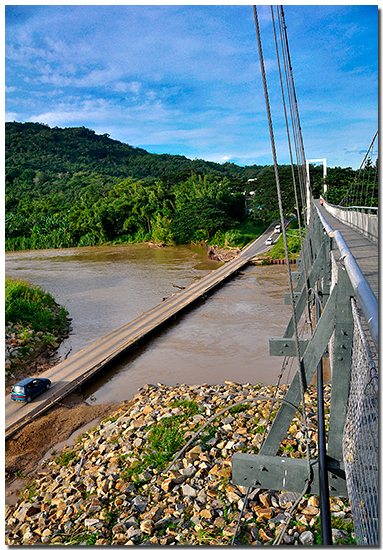 The two bridges of Tamparuli. Remember the song Jambatan Tamparuli? Tamparuli Tamu ground. 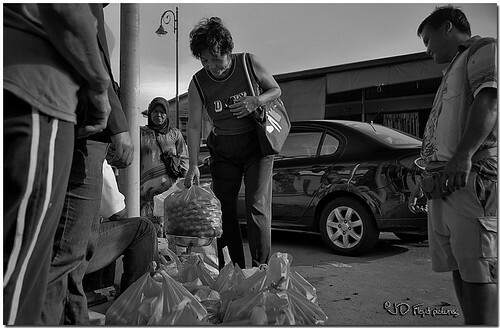 The weekly bazaar is on Wednesday. 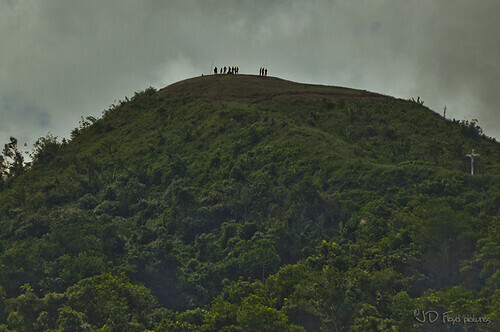 The hill at the background is Bukit Ruhiang, the highly potential take-off spot for paragliding enthusiasts. 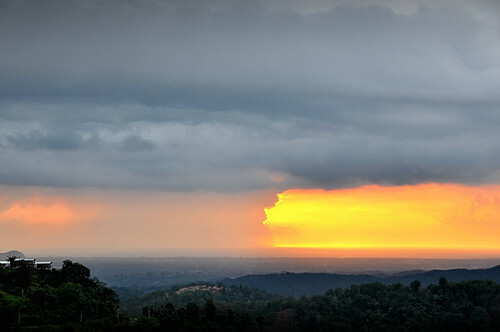 Sun setting behind oncoming rain, seen from Jalan Ranau, Kg. Minangkob Tamparuli. 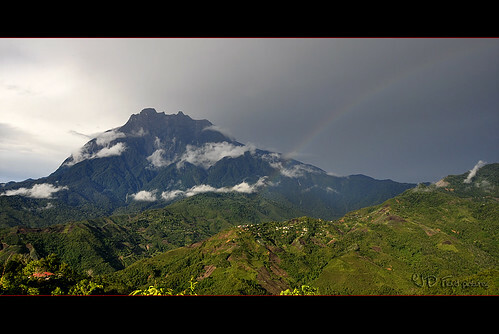 Mount Kinabalu viewed from Pekan Nabalu, Tamparuli. 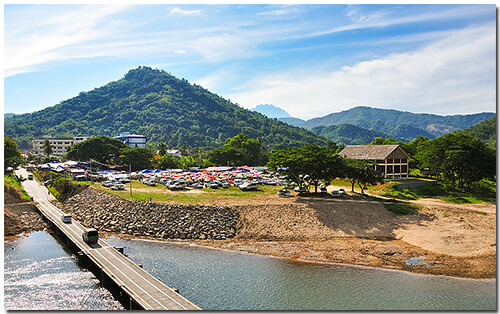 If you are travelling to Ranau, Sandakan and Tawau, don't forget to spend sometime to enjoy the spectacular view of the South East Asia's tallast mountain from this location. Itu last year punya langsat, tahun ni belum ada lagi. Yang ada durian saja. Thank you for sharing these beautiful photographs and insights. Appreciate your visit very much! I love all the beautiful photographs. You are an amazing photographer. Keep up the good job, mate. smilla4blogs, PriNceSs AdOnAi, Gunaqz- Thank you so much for the kind words. I know I'm not there yet but I'm happy with things and feel encouraged at the same time. Dev Clarehova - harap2 dia tidak kisah gambarnya masuk dalam blog. Dia nampak menyerlah, jadi ramai org ambil gambar dia. halu, mencari-cari tempat paragliding sini sabah, jumpa sudah..ada ejen yang boleh d hubungi ka ni kalu mau join aktiviti paragliding ni?